Description: Bill Burke's knives are as high performance as a hunter knife can get. 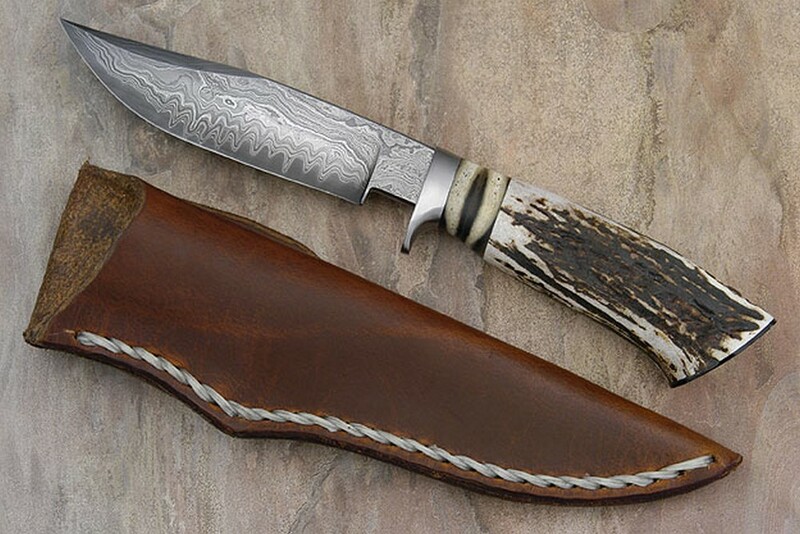 The dramatic san mai blade is forged from1084 carbon steel wrapped in Bill's own damascus steel (forged from carbon steels). 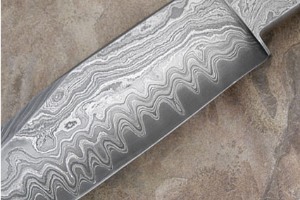 San mai is typically made by forging three separate layers of steel together (Damascus or mild steel on the sides and carbon steel at the center core). 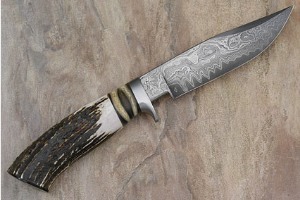 In this case, Bill wrapped the Damascus steel around the spine of the knife, hiding the central core line that is typically visible along the spine. Bill pre-tests each knife that he makes for edge flex and cutting ability before assembly. The heat treat follows the formulas developed by Bill in conjunction with Mastersmith Ed Fowler, and creates some of the sharpest and most long lasting edges found anywhere. 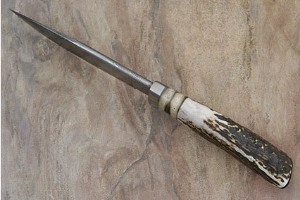 The handle is formed from a section of elk antler and shaped much like Bill's sheephorn handles. 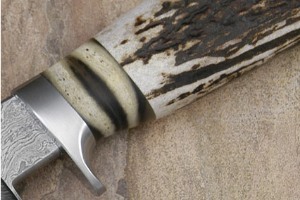 The front spacer, like his Pronghorn Hunters, is formed from two end cut sections of sheephorn set side by side. 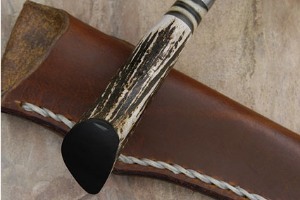 The handle is finished off with a cape buffalo horn end cap. 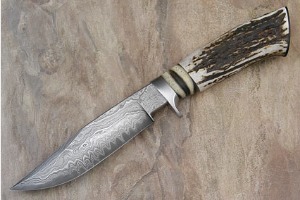 Great feel in the hand on a knife that has exceptional "presence". Excellent fit and finish throughout and a phenomenally performing knife. 0.40625 0.140625 406.25 140.625 Trailer Completed.